John has an enthusiastic love for the outdoors and the use of technology to enable sustainable living. Before coming to CAT, John spent 27 years working in the museum world, where much of his time was spent on bringing historic sites and technologies alive for visitors. John graduated from the University of Salford in 1985 with a 2.1 BSc in geography. The following year, he began his museum career at the Bass Museum in Burton on Trent, becoming assistant curator before moving on to a 25-year career with the Ironbridge Gorge Museum Trust in Shropshire. 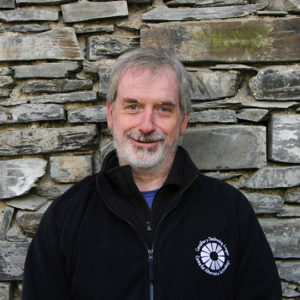 There, John was heavily involved in the development of three key sites including the creation of a hand-on design and technology centre as Curator of Technology. Latterly, he took on the role of operations manager for Blists Hill Victorian Town site before leaving to join CAT in 2015 as Head of Eco Centre, heading up the site’s Estates and Engagement teams and helping to lead on the site’s redevelopment. John has always had a practical interest in all things mechanical and in building. He lives near Llanfair Caereinion, where he’s working on the restoration of a cottage and small holding.